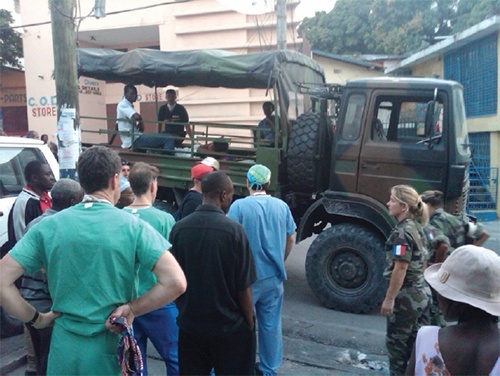 Dr. Parsley was part of Haiti Earthquake relief efforts organized by AAHKS 2nd Vice President Carlos Lavernia, MD. Below are pictures and e-mail reports Dr. Parsley managed to send us, despite his exhausting schedule. I have arrived in West Palm Beach for the evening and we leave at 5:30 in the morning on a private transport for Port-au-Prince. It is so nice to get a little information from our team leader this noon that you will see attached below. I accepted this assignment with Blind Faith when my friend Carlos Lavernia sent me an email about 5:00 pm Tuesday basically saying he had a plane leaving on Friday morning out of Miami and he wanted me on it. I sent him a quick email back saying “Yes” and that is all I knew until today regarding who I would be going with and where we were headed. The adventure begins. We have a variety of people from all over coming together on our team, none of whom I know but several of whom are from Haiti. It seems a bit surreal as I go from this beautiful place of West Palm Beach to a place of devastation in Haiti. We will be working out of two collapsed hospitals but in a relatively safe area of town compared to others. I will try to keep you posted as best I can but otherwise I will update you when I return next Saturday. Thank you all for you kind words, thoughts and prayers and a Special Thanks to my friend Tuck for all the food supplements and help he provided. No need to respond to my emails since I will have limited time. I know you are all behind us. 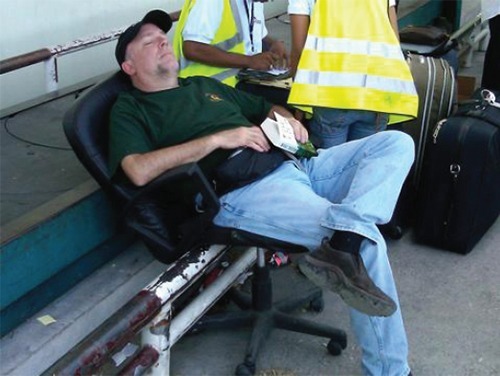 We have successfully made our trip to Haiti but the logistics have been difficult. A special thanks to the Hendrix Racing team for donating their two jets for Missionary Flights International to use for transport. Our all-day travels yesterday had many unnecessary delays at every turn with multiple Transportation challenges. We arrived at the hospital with our group of 20 eager people which includes four orthopedic surgeons, two vascular surgeons, two general surgeons, four anesthesiologist and several nurses ready to work. The hospital had no patients. We are in the process of radio advertising and networking to funnel the patients our direction and hopefully this morning will be a different story. The city is devastated and people have moved out into the streets to live due to the collapse or fear of collapse of their buildings. There is no water and little electricity except by generators. Gasoline is just now becoming available and limited shops are open. We are staying in a structurally sound building all over the floors. Special thanks to my friends for the food which was used last night to feed many and the drink that was dropped into my trunk that we passed around to celebrate the day. Special thanks to Tuck for all my bedding equipment, it was invaluable. We have been networking with a large group from Mt. 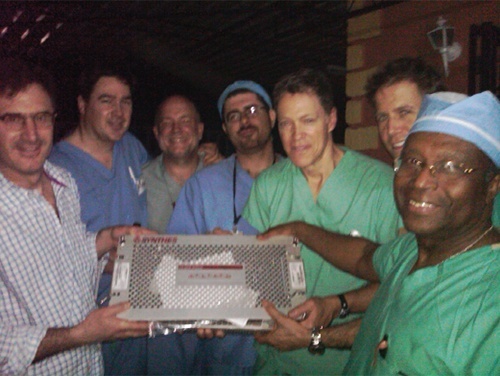 Sinai Hospital in New York who are working at the main General Hospital in the center of the city near the epicenter. In addition, we are looking at other alternatives. The situation appears to be improving on a daily basis based on reports here from all those we meet, but it will take months to years. Once the acute situations and needs are addressed, there are multitude secondary procedures that will be needed. In addition, the challenges of rehab and the need for prosthetics will be incredible due to the number of amputations that have been performed. The word has gotten out that we are here. The patient flow has begun from the French bringing in a load of patients from far away to us, as well as the US Army transporting six patients via Huey helicopter to our doorsteps. I feel like the MASH series when you hear the helicopter coming and Radar O’Reilly announces their arrival. It is either feast or famine. The patients are now a week and a half out from their initial injuries and in need of secondary wound care and external fixation. The high point of the day was the treatment of a mother and daughter who came in from the main soccer field in the center of the city, who had a pelvic fracture and was severely disabled. Her baby was also crushed at the time as well. Due to her own injuries, the mother was unable to care for her child. 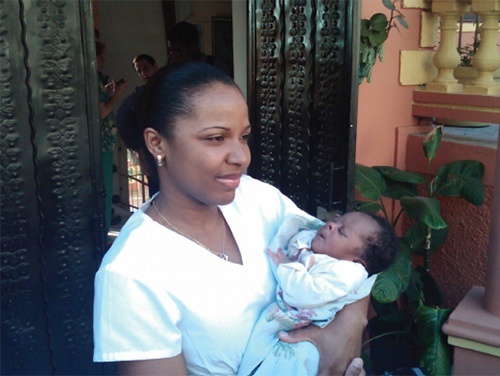 She came to the hospital and her child was near death due to dehydration. Were worked on both and we were able to rehydrate the baby and provide care for the mother. By the end of the day, both were doing better. 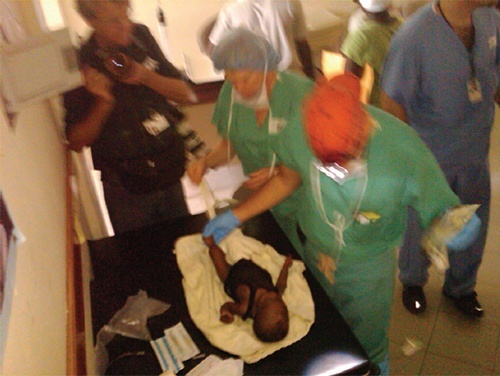 See the picture attached of the baby undergoing treatment. Today, I went to the tent hospital of the University of Miami at the airport in search of supplies and to evaluate treatment protocols. These people are doing a great job of first line treatment and have so much support, but all of us are faced with supply line issues of support or lack of support. We need supplies, there are so many who want to help but cannot get it to where it needs to go. There are so many supplies on the tarmac at the airport that we do not know what is there. We could all use these supplies. I volunteered to go to the US Navy ship Comfort today but have not heard back. I hope that this message is getting out. You will see a picture of this as well. I also reviewed a plastic surgery clinic. You will see a photo of the tent in the middle of the street that is the convalescent area, but unlike our location one block away, they have nurses and food and comfort that our nice hospital does not provide. We are frustrated because we have the surgical expertise and were told that we were coming to a hospital that had infrastructure support but in fact it had none. I have been amazed by the lack of support by the Haitians who work at the hospital but I am encouraged by the patients and their families that we have treated. I hope we have made a difference. At the end of the day today, you will see a picture of the French Military bringing a whole host of patients to our facility that need care. Some patients unfortunately beyond our capabilities. Again very frustrating. Hope you had a Great Day! 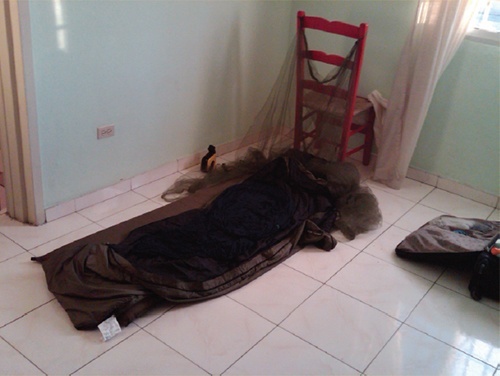 After another comfortable night sleep in my Beautyrest bed (see attached photo) and bucket bath shower, we headed back to the hospital to face the challenges and take care of those in need. Each day our team works better and better together rounding on patients, prioritizing care and taking care of business. It is always wonderful for me to see all the transitions in the hearts of those doing the work and providing the care. You will see pictures of Steve Schutzer, MD and I taking care of a patient in need of a washout of her above knee amputation and set her up for the next stage of recovery. You will see a picture of a very common problem that we have been treating and that is a crush injury to their extremity and especially their feet. The degloving injuries have been common. As a result, we have developed a relationship with a plastic surgery clinic two blocks away that will provide follow-up care for all the wounds that we have cleaned up and are in need if skin grafts or wound care. This has been a great relief to the team that those that we care for will be provided care. In addition, the local docs and nurses have begun to show up and begun to integrate into the care system and therefore will be able to provide follow-up care. We are still in desperate need of additional supplies and have been taping into any sources that we are aware of. 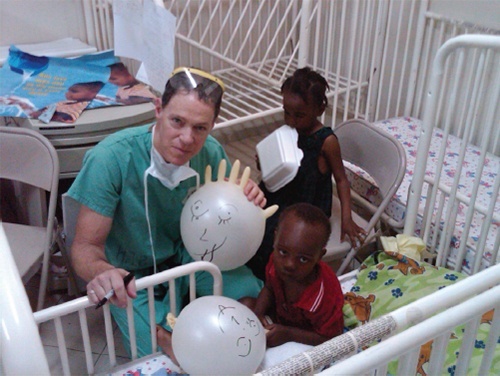 If we can get more sterile packs for surgery, we could do even more. Our day today began with a host of surgeries that all required a little MacGyver in the team to utilize the equipment that we have to make it work from the modification of reduction devices to fix broken femurs to the creation of wound vac devices to improve wound care management. It is fabulous to see the creativity evolve. I would love to have a Home Depot with an unlimited account to tap into. We would go wild! While many of us were operating this morning, Dr. Z, a trauma surgeon and others would head into the core of the city to the main soccer field to triage patients and send them to our hospital for treatment. The patients somehow would get to the hospital before he and his team would even return. Following the second wave of surgeries, I recruited a local to help me transport a patient to the Plastic Surgery hospital with the French team. Following the admission of the patient, I went begging for supplies. When I went to the OR, the French Orthopedist was starting to operate on one of our Patients that we sent yesterday who needed a femoral rodding with equipment that we did not have but they did. I scrubbed in to join her to complete the task. It was fun to see the difference in techniques as we were able to fix this patient’s femur fracture and hopefully get her back on her feet. Following that, I went back to begging and was able to get seven sets of crutches we desperately needed. As I was headed back to our hospital with all these crutches in tow, our friends from the Mount Sinai Hospital in NY drove by and were talking about it when I got back to the house for dinner. We all laughed when they realized it was me. The Mount Sinai group will be headed back on Wednesday and I hope that we will be able to receive some of their supplies. The search continues. 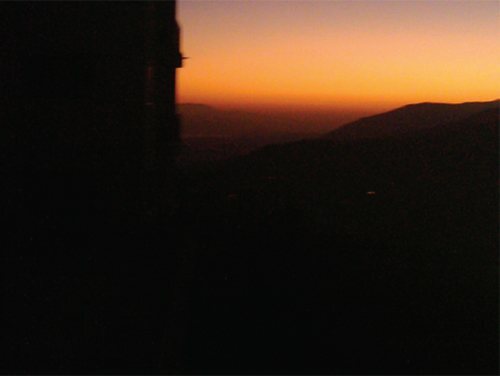 Today was an eventful day that started with a beautiful sunrise over this devastated country. A moment of beauty to cause one to pause and reflect at the start of a day. It is a bit overwhelming to see all the destruction that has occurred as the result of a natural disaster that in less than a minute of time the entire world that you have known around you changes and beyond your wildest dreams. It looks like an A-bomb hit this city as you can see from the pictures with entire areas without a house standing and people all living in the streets, some out of fear that an aftershock will hit and finish the job and others because their house is already destroyed. I drove through the city again today by a different route and saw the National Hospital where so many volunteer medical personnel are present with a facility that is minimally functional. This includes our friends from Mount Sinai Hospital with whom we are sharing accommodations. 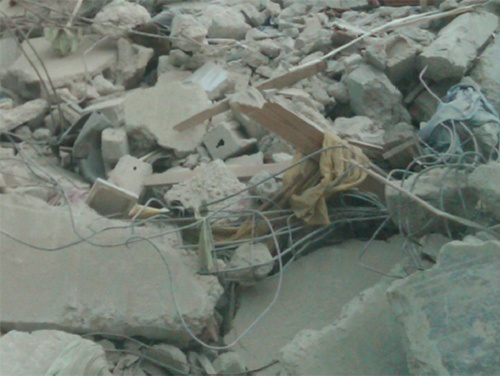 Many patients died in the hospital as the walls and ceilings collapsed on top of them. 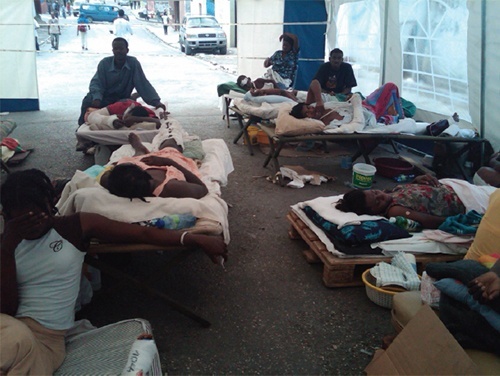 Hundreds of patients are seen daily at this facility by the medical team there and most are followed in their temporary quarters in the city parks. CNN, FOX and others have been there and daily the celebrities walk thru with the photographers in tow. Please don’t believe the news reports that highlight the negatives that are presented or the questions of where are the Americans and why aren’t they doing more. I am proud to be an American and proud to be here representing my country caring for those in need. We all are doing the best that we can with what we have. No one at any time could have planned for this devastation and the extent of injuries that have occurred. Our news networks are doing such a disservice to the world for the sake of an “interesting” story to highlight something of relative insignificance. They just get tired of telling the truth and all the good that is being provided. As long as we all work together we can all rest at night knowing that we have done the best that we can do. It is impossible for anyone to step into a country that has little healthcare infrastructure in place in the first place and are light years behind where we are in the USA. Then add to that the destruction of what little they had left and then to have this type of disaster that requires tremendous resources to address. This is an impossible task at any time, at any place and anywhere. Next I drove by the University of Haiti Nursing School next to the National Hospital and was overwhelmed with the story that all the nursing students died in the earthquake while in class that day. This is incredible, especially at a time when nursing care and support would be so critical and now they are gone. This is also true of the universities that had a similar occurrence with entire generations of the brightest and best of Haiti being wiped out. Most families here cannot afford to send more than one of their children to the university and therefore select the brightest of the bunch to go. This loss will take a generation to repair. Next we went to the main soccer field to drop off three of our team members to triage patients in need and refer those we could help back to the hospital. They saw 60 and referred 15. Next I went by the Parliament and the Palace both of which were destroyed, along with the cultural history of the country. My day took a turn for the better, though, when I got to the airport and found that our palate of supplies had arrived. My driver and I loaded up the goods to the brim. I felt like Christmas in January because these needed supplies would allow us to continue in our mission to serve. We then went by the food supply and loaded up with MREs (meals ready to eat) for our team and the patients at the hospital. No space was spared. I felt like Santa Claus when I arrived back from the trip, as we looked thru the boxes to see what surprises were within. Many small wonders brought us great joy, like the presence of an old manual hand drill that would help us tremendously. Today our team efficiency continued to improve and what a great job they are doing. We completed nine surgical procedures, followed up on wound care and dressing changes and delivered all those fancy new crutches that we received yesterday to get our patients up and moving. Lots of progress was made. Everybody is doing a great job and doing their part, however big or small. They are all going beyond their normal routines with one focus in mind: the patients. The flood gates have opened and the jungle communications networks are in place. Our team is hitting their stride for the long haul of the week. On Wednesday, we were flooded with patient and were able to complete 14 procedures for the day. This included a variety of cases from repeat dressing changes and further wound clean-up to insertion of a cheat tube in an elderly woman that had breast CA that our general surgeons removed two days earlier to an Open Reduction & Internal Fixation of a patient with a intraarticular tibial plateau fracture (upper calf bone fracture that entered her knee) and one of the few patients that had intact skin and tissues surrounding it. The number of patients who have sustained open fractures is amazing and the amount of time that has passed since they have been treated creates a major challenge in their treatment options. Do you attempt to salvage their leg despite the infection present and know that it will result in significant challenges of wound care management and repetitive operations with the probability of failure and the unknown question of follow-up or do you do the more definitive procedure and amputate their leg resulting in a more rapid & predictable recovery but with the reality that there is no way this country can even remotely handle the volume of patients that will need care and artificial limbs. This will be a country of crutch ambulators. Many of our patients are in fear anytime we take them to the OR that we are going to cut their leg off. I was repairing a young man’s ankle yesterday under a spinal anesthetic and used a saw to freshen the bone edges due to the delay in treatment. When the man heard the saw he panicked and asked anesthesia if we were cutting his leg off? We lowered the protective barrier so he could see that we were not and a huge smile came to his face as he watched us finish his operation. The team has come together beautifully with all of us extending beyond our norm and doing whatever it takes to get the job done. Kevin Burton, MD, AAOS fellow has taken over directing the OR schedule and tracking patients on the floor as well as adding his expertise to the many hand injuries that we have faced. Tom Lyon, MD, AAOS Fellow and ortho trauma surgeon from Brooklyn has been the go to person for treatment recommendations. He and our vascular surgeon developed of our wound vacuum system to successfully salvage many of the limbs that would have been amputated. (See photo). Steve Schutzer, MD orthopedist doing it all to assist in providing care, even entertaining the guests (see photo). The general surgeons were led by Dr. Z who has become the triage specialist and travels each day with a team to the central soccer field to screen and treat patients. All are pitching in with the continuous eye on the ball and that is caring for those in need. The stories never end. This medical mission is life changing for all of us and sharing it with you hopefully helps you share in our experiences. The challenges, the heart ache, the joys and successes and despite the language barriers for most of us, the warmth and bond that occurs between each of us and our patients is still communicated through the love of our smile and the compassion of our touch. This crosses all barriers and puts hearts at ease. As the debates in Washington continue on the deconstruction of our Healthcare system and even among the chaos of destruction in Haiti, this gift is unchanged. This is why we all went into medicine in the first place and can never be taken away. As our last day of surgery came to an end, our team all had mixed emotions. 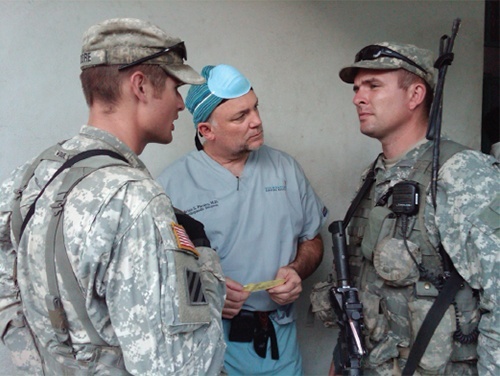 The success of this mission was very satisfying for all as a mixed group of physicians and nurses who came together as a team to provide service. 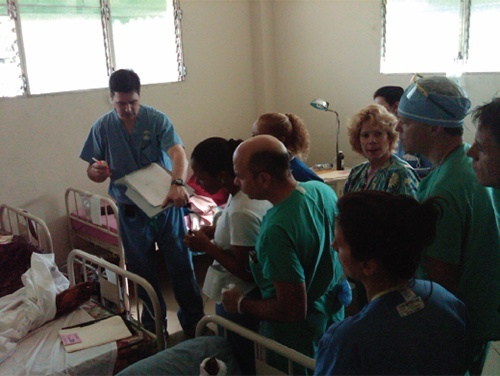 We were able to complete over 70 surgical procedures for the week but we touched the lives of many more. We were able to perform 11 of our most difficult cases on the last day. This was accomplished with teamwork and resource management and as the week progressed we were even more efficient than at the beginning. We began the week in a hospital that was closed and now it is open and full of patients. We began with a hospital staff that was very resistant to us but were able to have them embrace us by the time we left. We overcame supply issues and developed networks of connections to allow us to continue to work. By the 8th day, we are all aware that our trip would be ending but the work in Haiti is only beginning. The last couple of days saw the arrival of multiple organizations which included the Russian Team who were headed home but dropped by to deliver a few patients and their leftover supplies. We made good use of them immediately even though we couldn’t read what they were. The US Army team also finally came by to do a needs assessment and evaluated the facility. We also had discussions regarding a sustained supply line of Orthopaedic and OR materials. We also discussed the need for infrastructure buildup with much needed equipment for the hospital. (See photo). This would significantly improve the capability of this facility with the idea in mind to create several centers in the few structurally sound facilities around Port-au-Prince such as ours. This would include the development of Musculoskeletal Centers that could address the long term needs. Lastly, we had the Philippine team come by with the UN to review our facility as well. Thankfully this team of qualified surgeons and nurses committed to stay at our facility for two weeks. This was a great relief to the team since we did not want the efforts to end and the continuity of care for our patients disrupted. 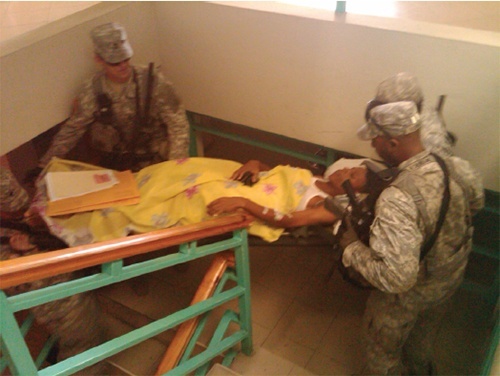 Another highlight of the day was the US Army’s willingness to transport one of our spine fracture patients with paraplegia to the University of Miami tent for possible evacuation to the US for further treatment. Alex will be challenged but we felt satisfied that we at least had him another step closer to the treatment that he needs. Where do we go from here? Do we come home and blend back into our lives as before or do we continue to make a difference? We need to pool our resources with all the connections that have been made to develop a long term and sustained effort in Haiti. 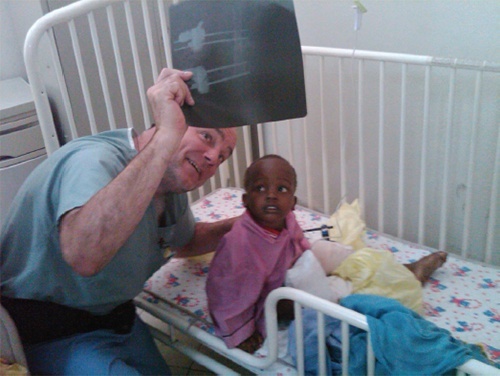 Over 150 American Academy of Orthopaedic Surgeons have already served in Haiti and over 500 more have signed up to serve. The AAOS needs to step to the forefront and help to coordinate this effort and develop these Centers for Musculoskeletal Care and assist in staffing these centers for months if not years into the future. There needs to be comprehensive care with Physical Medicine and Rehab doctors, physical therapists for training, occupational therapists and especially prosthesis for all the missing limbs and orthotist for all those with nerve injuries and adaptive needs. We need to pool from all the network of contacts from the head of the US Army, 73 Calvary which is Gen. Keen to ensure that the supply line is maintained, to the head of the Haitian Medical Association, Dr. Claude Surena who is the in country coordinator and friends with our team leader, Dr. Saidel Laine. We have contacts with the President of Haiti who will be the ultimate decision maker to reallocate resources. We will need to ask the Orthopaedic industry, many of whom have already given, to give some more. We need to talk with our PM&R colleagues to commit to assist us as well as the therapist and Prosthesis and Orthotist. There is lots of work to be done and the needs will change. Currently we are managing broken bone and many, many open wounds trying to salvage as many as possible. There is a continued need for hand, foot and trauma surgeons and plastic surgeons. This will continue into the foreseeable future. The needs will then change to reconstructive trauma, infection management and prosthetics. 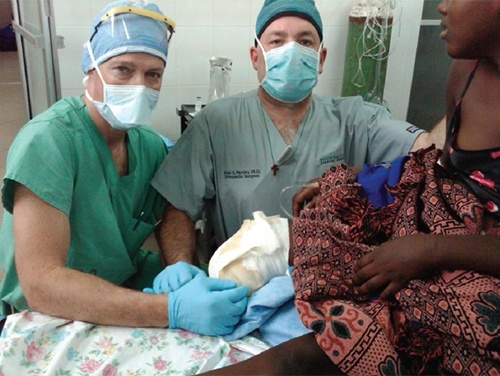 As time goes by, the Haitians will need my services as a joint replacement surgeon as well as my friends Steve Schutzer and Carlos Lavernia, who was instrumental in starting Operation Walk Haiti. Let us carry this through. This has been an incredible experience and I hope you enjoyed being a part of this mission through these stories. We all can make a difference. As I am constantly reminded, the Good Lord gives us all gifts; it is what you do with those gifts that makes a difference. Thank you again for all your thoughts and prayers over this past week, it made a difference for me.